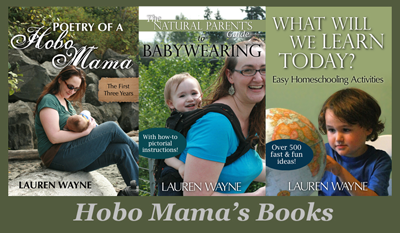 Hobo Mama: When (& how) to leave children at night? This is a different kind of post, because I'd like to ask you for your answers to a reader question. It's somewhat in honor of the BlogHer conference going on this weekend, which I am decidedly not at. "Have you even needed to (or wanted to) leave for the night? romantic get a way, girls night out, etc. How did you deal with being away for a night?" My answer is, I haven't yet! I can explain a little about my choice and circumstances, but then I thought I'd open it up to you to give your thoughts in the comments. I think this is a subject that means a lot to attachment parents, and particularly those who are breastfeeding, because it opens up all sorts of concerns and questions. When you're used to parenting or nursing your children to sleep, how will they cope without you, even for one bedtime or one overnight? And even if they could do fine, do you want to leave them when they're young? At what age do you start feeling comfortable with the idea, and for how long could you be separated? If you don't leave your children, do you start feeling trapped — or, conversely, if you don't want to leave your children overnight, do you start feeling criticism from people in your social circle who don't understand your choice? The answers are probably different for each parent. So, here are my experiences and my thoughts, and then I'll open up the floor. I haven't personally left Mikko overnight since he was born three years ago, and I haven't had anyone else put him to bed. (This is our personal experience, not advice I'm giving out here.) I'm sure, in a pinch, his father could, but we haven't had that pinch. I guess that's kind of the point — there hasn't been a real need for anyone else to put him down, and no need for me to leave him. Until recently. But more on that in a minute. Mikko's bedtime is late. Like, really late. We have that luxury because we work from home and don't have a great deal of scheduling shenanigans to deal with. So Sam and I can take date nights and get home at 10 and still put Mikko to bed ourselves. That said, we don't do that much, because he gets pretty cranky the later we're out — and, frankly, he gets pretty cranky being left at all. We have babysat for other kids, through our babysitting co-op, who couldn't care less that their parents are dropping them off with near-strangers — who laugh derisively at separation anxiety — and then there's our little guy. He can be left with babysitters and his aunt or his grandmas, but even when I leave him with his father, there's some sadness. When we drop him off with people he's not familiar with, there's a kind of blank despair. We're still having our issues with taking him to his half-day preschool twice a week. At this very moment, Mikko is sitting next to me as I write, because he wouldn't stay downstairs and play with his (willing) father. He's just a homebody who loves being near his parents, and me especially. I don't blame him for that, though, or worry about it. Because I was exactly the same way. I totally understand his desire to be where he's comfortable, and I remember the keen anxiety I would experience when I was separated from my parents, even well into elementary school. This is not to say that I think I shouldn't ever leave him (we do) or that he won't grow gradually more used to being left (he will). It's just that we tailor our parenting to his own particular needs, and I'm not comfortable, with this particular child, with leaving him overnight at this point. It's funny, because Sam and I went on barely any dates alone our first year or so with Mikko, and everyone was offering, especially Sam's nanny sister. But we just couldn't figure out how to swing it. Mikko was nursing constantly and we hadn't taught him to take a bottle; how could I leave him hungry? Even when we did occasionally go out for a couple hours in the afternoon here and there, I would end up so engorged and uncomfortable. Plus I was thinking about him the whole time we were gone! It was just easier on all of us to stay together. So we did. Sam and I have always gone on plenty of "dates" — with baby in tow. We never felt that having a baby or breastfeeding meant we had to be confined to home, so we went out frequently. Yes, we had to choose our destinations based on what was baby-friendly — and, as he grew (more mobile), those restrictions changed again. But our tastes run to the family-friendly, anyway, and Sam and I, for the most part, have no problems amusing ourselves at science museums, outdoor concerts, casual restaurants, outdoor rambles, and movies on the wall, and skipping out on whatever doesn't work so well for little kids. Once Mikko was drinking from a cup, I tried pumping milk for him to take with him to preschool and for babysitters — but he never drank it. He always just wanted to wait for me to return. So, with that and the fact that he still nurses to sleep and during sleep, I just have chosen not to stay away overnight yet. Sam will now take Mikko out during the day for up to eight or so hours at a time (we trade off childcare and work time), so clearly he can handle the hour amount of an overnight separation, but I don't feel confident that he would do well being left at night — or even having me leave him for that long. It's a little different if he's out having fun rather than the other way around. And now that we can leave him for dates, wouldn't you know it: No one's offering babysitting anymore. That's why we started the co-op, because apparently people only wanted to sit for a cuddly baby, not so much a toddler or preschooler. Or, for some people, maybe it's just that they gave up offering since we used to turn them down. Anyway, I've had two opportunities to leave him overnight recently and turned them both down. The first was BlogHer, the blogging conference taking place right now in New York City. I knew if I went I would be super busy with the conference itself, but then what were my options? I could go alone, and leave Mikko for the weekend, which didn't appeal to me. I could go with Mikko and Sam, but that would leave them to amuse themselves throughout the conference (which they could do, it being NYC and all) — but that would be expensive and sounded exhausting for all three of us. Then a dear friend of mine sent me an invitation to her final vows to become a sister, and I was torn once again. Could I go by myself? I looked into red-eye flights that might deposit me in the right place in the morning and allow me to leave again in the evening, but the schedules didn't work that way. I would have had to be away for probably two nights at the least. The prices were very high, inordinately high, when I looked for tickets, so the idea of bringing all three of us was too expensive. But that left bringing just Mikko and relying on unfamiliar childcare for any events where he was not welcome — how would that work out? So those are my stories. I've so far chosen not to leave Mikko overnight, and for the most part I've been content with that decision. Sure, every once in awhile, I have a pang of nostalgia for those old days of traveling on the fly, or a sense of missing out on something fabulous. But I figure: There will be time for adventurous and solo traveling later. Nothing was so urgent that I had to go. Children are young for only a relatively short time, and my needs can wait. I say that not in a martyr sense but in a peaceful one, because it's true. Really true. That said, I can see circumstances (and have seen, in friends' experiences) where the variables are different. You might need to travel somewhere, such as for a family emergency or a work trip. You might have a schedule that demands more of you than mine does of me. Your children might not be as anxious about separation. You might, quite simply, just want more space. How do you deal with overnight separations from your child(ren)? Is there someone else who can put your child(ren) to bed, and how did you work that out? At what age did you first leave overnight? What are your thoughts on what the right age is to first leave child(ren) overnight? Do you have any tips for parents who need to do so? I have a few guidelines before we start: While you're welcome to say, as I have, that you have chosen not to leave your kids overnight at a certain age, please be respectful of those who have made a different choice by not making blanket statements about what is "right" in that respect. There are many reasons someone might need to or want to leave their kids, and many different child personality types and potential attachments to other relatives and friends, so what doesn't work for one family might work fine for another. On the flip side, if you do leave your kids, please don't judge those who choose not to, for the same reasons but in reverse. I know you guys are marvelous, though, and don't need coaching. I just wanted to make sure any trolls know to stay away, and I want to make sure any readers who ask questions are given respectful answers. Thanks in advance! The first time we left Nicholas alone for an 'overnight' was June of 2009, when he was 16 months old. We do not now live near grandparents or other relatives and frankly, don't ever see that as an option (husband's career). My dad and stepmom were in town that night and offered to care for the kids. We decided to try it at the last minute...and it really worked out just fine. My father read and rocked Nicholas to sleep and then slept in our room with him (Nicholas co-sleeps in our room). When Nicholas woke up, my father took him in our bed with him and they slept together for several hours. He had his normal yogurt drink (kefir) for breakfast, and while I definitely noticed him not having his morning 'na-na', he was no worse for the wear. I have had to leave him with his father (my husband) on two other occasions...once when I went to a baby shower (across the country) last fall and then again in the spring when I took a house-hunting trip. I was worried it was too soon, but shouldn't have stressed so much...I pumped and dumped on the first trip (4 days total) and simply manually expressed on the second (5 days). I did not take him with me because both trips were physically and mentally draining. Fun for me, but draining and would not be fun or exciting for him. Instead, he stayed at home with his father and sisters for both trips. My biggest fear was that my milk might be affected and/or his sleep. He did not sleep quite as well, but the milk supply was fine. He is still happily nursing today, and I anticipate it will continue for a bit. Why did I leave him so 'willingly' (well, not really, but probably appears that way)? The trips would have been stressful for him with jet lag and not much down time. I also wanted him to have extra time with his dad, who is now in Iraq for a year. In fact, one trip became necessary when we found out about his deployment, and thus I felt the time together was even more crucial. His father did put him to bed quite frequently prior to the trips, so that was not an issue (I would nurse, then he would read and rock). I am also very glad that he had extra bonding time with him, as he really misses him right now, but at the same time, really knows and loves him having spent so much time with him. For the record, when I responded, as quoted in this post, that I do have to be out at night for meetings now and then, I was referring to being gone during my baby's bedtime. I have never left Joe overnight yet. I'm supposed to go to a meeting and evening reception schmooze-thing out of town in September, and I was already plotting how I would sneak my husband and baby along with me, rather than go a night without my (then sixteen month old) baby! I am glad that it's possible for my husband to put my baby to bed without my help - it's necessary for me to be away some nights (until after midnight sometimes!) for my job, and I do occasionally go out with friends. But I'm always so happy to crawl into bed with my baby, get him on the breast, and fall asleep cuddling him. I can totally understand just never wanting to away for bedtime. I'm 90% there myself. I have not yet been away from my daughter (26mo) overnight. We're homebodies, and the most we do is an evening here or there, and generally have no issues bringing her along so far. With a planned hospital birth looming at the end of the year, that's going to change; I'm guessing I'll be away at least two nights, and be grateful for the toddler-free time with my newborn! However, she can and does regularly go to bed without me (with Daddy), and we're no longer nursing (my milk dried up a couple months ago, and we were down to just bedtimes anyway); because I spend one evening a week out, she is very used to going to bed and not seeing me til morning. I don't know how she'd do at daycare or preschool, with several hours of no contact with either parent, or at least someone she knows well. I think she'd be ok in the long run... but I don't know. It hasn't come up, and I don't think it will any time soon. Thanks for the clarification, Inder! I got what you were saying (about bedtime vs. overnight), but I think my writing in this article was really choppy due to the distractions I mentioned along the way. :) I was considering revising it more, but … ah, but! I didn't. :) Thanks for your perspective, particularly as an attached, working mama. Jen: I'm glad your trips went smoothly. How wonderful that his dad got so much quality time with him before the deployment! 1. I am a commited breastfeeder (Champion Nurser, as some call me) and I nursed both of my babies to sleep EVERY night. Sometimes I'd get them down, then sneak off, to return when I wanted or when they woke up. I never expected them to put themselves to sleep. 2. Our boys share our bed. Our first until he was 2 and ready to move out, our second at 15 months and counting. 3. our boys usually go to bed when they're ready. That's usually 10pm, sometimes later. 4. I have never done any "sleep training" and don't even schedule naps. My boys sleep when they're tired. Or when they fall over from exhaustion! :) I've always had sleep issues so I want them to develop healthy sleep habits, starting with sleep time always being a gentle and pleasant experience. 5. we don't "do" crying at my house. We're a no-cry zone! All of that developed from a place of wanting to be attached and wanting to do what worked for us....mostly me, a night owl!! I decided early on that if I wanted to do all of the above, I was esentially surrendering my right to have anyone else get them to sleep at night. So....we didn't do any weekend getaways and I didn't go on any long trips alone--that was just a sacrifice for them. ANYway, I serve at my church when my first son was 1, and we had a retreat. My mom and my son came with me so I coud nurse him when he needed it and we could sleep together. Then when he was 21 months old, I had a leadership retreat to attend. At that point, he'd gotten use to sleeping (usually naps) with my husband and would accept comfort from him during the night to help him re-settle. Knowing he'd be fine, I went on the trip (having to pump while gone) and he did great-no trauma!! Our second son was 3 months old when I was due to go on another weekend retreat, so I took him with me! Now he's 15 months old and I'm due for another retreat so we're going to practice for a few weeks to make sure he'll handle it ok....and if he can't, I won't go! For me, it's just another sacrifice to give the best to my boys. P.S. I'm also putting off getting my wisdom teeth out until my son is weaned! My mom was an AP mom back in the day, and I remember the first time I spent a night away from her was when my brother was born, and then not again until my other brother was born (I was 3 and 8). My parents NEVER left us alone, even in high school. But they never really went anywhere either. My son is 5 months old and we're headed to a friend's wedding out of state in a few months. Instead of leaving him at home with grandparents like many of my friends plan to do (they don't breastfeed so it's easier to leave their kids), we're bringing my mom along to watch him during the wedding. I'm so happy my mom understands that he needs to be with me! @ ProudGrits: it is so nice to see someone else that is putting of surgery for their nursing relationship. I had planned to get Essure, but didn't want to pump & dump. It wasn't worth it. It works out because now we've decided to have 1 more baby anyway! I'm having a hard time with the idea of my soon-to-be schedule including an early morning where I'm likely to leave before my baby wakes in the morning. I so love our mornings together in the bed! My daughter is nearly 11 months and I'm nowhere near ready to leave her overnight! I know I have some annual overnight events coming up that I really enjoy, but I'm just going to have to miss them. I don't think she is ready, either, btw. This was such a hard post for me to read and I was sadden by it because as a father who has always had a skeptical eye towards attachment parenting this puts into perspective the reasons why, which are grounded in my own relationship. Now that I have your attention... this is mainly because I haven't had a date with my spouse in almost two years. I was surprised that the post was about how parents feel about doing overnights because it is far removed from our reality. Beecher doesnt leave T ever. When T was four months I really pushed the date issue. I convinced her we left T at a friend of the family's home for about two hours. The date was terrible. T cried. Beecher was upset and vowed to never leave T ever again. That was October 2008. The point of this is not to complain but to express my sadness and gained clarity that leaving children for structured times is a topic of discussion for attachment parents which gets to the main point of my feelings in reading this post and within our own parenting ways in general: This fact that I do not go on dates with my partner has always made me resent attachment parenting at some subconscious level. The fact that this post discusses yourself and other attachment parents who actually have left their children for simple dates or even the premise of the post "overnight stays" is provocative. There would have to be an extreme situation to require Beecher to be away from T for any of the amounts of time listed above. An overnight- death or extreme peril. The discussion here is about the possibility of overnights.This conversation makes me hopeful that we can get to the point of at least accepting in some ways that it is okay to leave our little one. It is of course every parents decision and this forcing ones views even my own views or feelings on my partner is going to advance my desire. Thanks for the discussion nonetheless. Hey, thanks for quoting me! Great post! This can definitely be a challenging issue for folks! I realized that I said that we've never left our girls, when really, my oldest (now four) was left at night with Grandma for two days when she was two years old while we were in the hospital having my twins. She did great, though did miss us at times. My biggest tip for folks who don't want to leave their little ones at bedtime -- "date afternoon"!!! We LOVE this. We head out once all three girls are down for afternoon naps (2pm or so) and do something fun and leisurely (that we couldn't do with 3 kids in tow) and then grab a happy hour dinner. Home by 6:30 pm at the latest, to put the kiddies to bed. Babysitter (usually family members) can chill while the kids sleep, serve them a snack, play, and serve dinner. Works great for us! Our son is 12 months old and the only times Hubby & I've both left him was to go to Mass in a blizzard (the church was less than a block away) and for Hubby's graduation when he got his doctorate (2 blocks away). He was 5 months old during the blizzard, 10 months for graduation. Both times Baby stayed with Grandma and mostly played and even slept both times. He got pretty worried though both times and cried a little. We're definitely not to a point that we could do an overnight. @Travis-I don't know your whole situation, but for Hubby and me, one thing that works well is to do "dates" at home after our son is asleep for the night. We sneak off into the living room and eat ice cream and watch movies or play video games or board games. Or we spread a blankie out on the floor (since Baby's in the bed) and enjoy being married. When we go out to eat, we bring our Baby, but haven't found him an impediment to chatting lots and enjoying ourselves. When he was too little for high chairs we'd get Chili's to-go! Anyway, if you haven't already tried it, an at-home date could be fun for you and your wife. Good luck! I left Iris overnight when she was about 21 months old. It was one night, my friend and I took a train to Portland for a little girls' get-away. It was so worth it. She and her dad bonded and it was fantastic. She resumed nursing just as if I had never left. Eloise was left alone right at two. It was the night her dad and I got married. Her Grandmother put her to sleep-- with no issues at all. GMa didn't even co-sleep with her, which was what I did. Again, she resumed nursing like nothing had happened the next day. In both of these cases, I was absolutely sure it would be terribly hard on my daughters. In both of the cases, it was a complete non-issue, despite both of them being attached, co-sleeping, nursing toddlers. My ONLY advice is, if you feel the need, or you just plain have to, to leave your child for a night or two, don't over-think it. If your child is left in loving, capable hands, he/she will be just fine. All of this said, my husband's parents just offered to take our girls for two whole nights and I'm giddy with anticipation! Squee! My oldest daughter, other than a huge mistake we made in leaving her at 10 months for one night in the same town with my mom, didn't have an overnight anywhere until the night her sister was born when she was 2 1/2. If she had been as different child I would have let her stay, but I know she would have been scared because she is a very anxious child who has always needed me to be calm and give her my full attention. Anyway. After that night there was nothing again until she was four, I think, but I have never been away from her more than one night and always less than 24 hours. As much as I wanted to go to Blog Her this year I know that 2-3 nights away from them across the country would have been way too much . My youngest doesn't mind being apart from me as much as her older sister but as is true with the other one, she has never been apart from me for more than 18 hours or so. It's not just the breastfeeding, it's the attachment we have in general. I have never been away from my daughter for more than a couple hours at once. Maybe I am odd (or pathetic) but I find her company to be so much more enjoyable than anyone else, ever. I am such a homebody anyway though, I would rather have a nice night in any time. I really like this post - it makes me feel less weird about being happy to stay at home in the evenings during this season in our life. I mentioned it to hubby just now - asked him how he feels about the fact we've been on only 1 evening date in 14mths and he said "really - it doesn't feel like that to me". We go on dates while our daughter is awake - its win-win - a family member gets to have a few hours playtime with her (she loves it) and there are no tears because it doesn't involve bedtime. We also - like you Lauren - go on lots of family dates, eat out together in the early evening for example. Daisy loves looking at all the other people in the restaurant, and it forces us to have some good, concentrated family time, with no computer or TV to distract. Occasionally I have been out with friends in the evening after putting her to bed, and Phil will deal with any wake ups for a few hours. Daisy is usually ok with this but after about 3hrs will want me, so I don't stay out too late. I figure this time will go so fast anyway, so don't mind staying home a bit more at the moment. My eldest daughter was away from me overnight for the first time when she was about 18 months old. I had night weaned and I was pregnant so I didn't have a lot of milk anyway. I left her with my mom who was willing to sleep with her and lay with her for the 2 hrs it takes her to go to sleep. Up until that time I she had only had someone else (her dad or my mom) put her to sleep a few times. She had a late bedtime so it usually wasn't necessary. My youngest (now 14 months) has never been away overnight and I am not ready for that (and I doubt she is either), but she has had her dad or my mom put her to bed at night with a bottle, or now that she is over a year, cow's milk. She has seemed fine with it. I pump as soon as I get home to relieve engorgement. With the second child time away has become more desirable. My kids are 3 years and 10 months. I have never left either of them overnight. I think that I *could* leave my 3 y/o at this point, even though he is still nursing, but we do not have family nearby right now and I would not consider leaving him with a friend yet. I will probably leave my younger one over night (one night) when she is between 1 and 2 since she will have her big brother. By that time, we expect to have family living nearby. My kids are 5 1/2 and almost 2. I have not yet left my 2-year-old overnight. I decided not to go to BlogHer for that reason. I do plan to go next year, though. I put my firstborn to bed every night of her life for her first 3 years. Until 34 months old, that involved nursing her to sleep. After that, she still wanted me. Because I was working 3 days a week from the time that she was 1, I preferred to minimize further separations. But then I got pregnant, and I knew that when I gave birth it would likely mean a night's separation, and possibly several. I hemorrhaged severely after my first birth, and ended up spending 4 days in hospital recovering from the blood loss. While I didn't expect that to happen again, I needed to know that she would be OK if it did. I also knew that, for me, I didn't want my child at my birth. She wanted to be there, but I felt that if she WAS there that I would feel compelled to mother her, and I didn't want my focus divided that way. So, when my daughter was a few months past her 3rd birthday, we started doing overnight visits with her grandparents once a month or so. She loved it. I took it harder than her. She asks to go on sleepovers all the time now. I will say that my 2nd child is much more easy-going than his big sister was, and I find it easier to leave him. While I haven't left him overnight, I think the fact that he has his sister in addition to the other adults around him helps him. It's just one more constant in his life that he can count on, outside of me. My kids are 5 1/2 and 20 months and I haven't yet left either of them overnight. I am the only one who can put the to bed and I am fine with that now. I know that my daughter is ready for sleepovers though. My son can't be without mama for more than 1/2 hour and is still nursing. Plus since my second child I have to admit I don't even want to go out anymore, I like to stay with my tribe! I feel like this post could have been me saying the same thing about my son. We haven't left him with someone else yet (though like you we get offers all the time). He's 14 months old. I still feel like he's not ready yet. Maybe with a friend of ours that lived with us for a while, my son LOVES her. We really haven't ever felt the need to do anything with out him yet either. I have left him with my husband for a while... which is easy now that he's older. I'm not sure how to tell when the time would be right, but my gut says not yet. So I'll respect my instinct for now. I think it's different for every kid though... some kids kinda like to go have different experiences. I watched a boy at 14 months, who had an attachement mom and he was completely fine the entire time. I'm interested to read through the rest of these comments. Thanks for the great post. My son Dylan is 2.5 years old and I haven't left him yet overnight. I have had a few other people put him to bed though - my husband, my parents and my in-laws. We've had various weddings to go to and a few other evening functions where we've had to leave Dylan at home. When I'm home I nurse him to sleep, but other people generally cuddle with him in his bed and he will fall asleep. He gets a later bedtime with others so he is more tired and falls asleep more easily. That being said, I do enjoy putting Dylan to sleep and don't go out that often at night, unless I have to. We have baby number two on the way and sometimes I think about going on a weekend getaway with my husband before baby arrives...but so far we haven't planned anything...I am hesitant and not sure if I am ready! I have so far never left our son, who is 26 months old, alone at night. I'm pregnant with my second, and if we have to stay at the hospital overnight for the birth that will be the first time--he'll be 27 months old. In preparation for that (and a second night nursling) I first night weaned him, and then months later when he was really used to that and had chosen to sleep in his own bed too, his dad took over nighttime comforting. Both adjustments went really well--if they hadn't, we would have reconsidered. For the birth, my mom will come and I know she will comfort him back to sleep at night and even sleep next to him if I ask her to. If she can't be here or it takes more than one night, then I will ask my husband to go home with him. I'm pretty sure he will be OK with it for one night, but I wouldn't feel OK having him without me for two! We've found few things that work well for changes like that. One, we let him know it's going to happen well in advance--a few days before at least, and we tell him many times on the day of...and we try to put it in positive terms--eg, "Tonight, when you wake up Daddy's going to come cuddle you, because Daddy loves cuddling you and he wants a turn to get some nighttime cuddles too." Another thing is that if we notice a change in his behavior--clingy, tantrums, etc...we take it as a cue that he wasn't ready and we back off the change. Last but not least, I think I have to be ready for the change within myself. If I'm not, I will project to him that the change is scary, sad, or makes me anxious...and he will take his cue from that. So I need to feel confident that he can handle it and convey that to him. Love your blog! Thanks for your thoughtful posts. huh. seems like i am in the minority here a little bit. next month, a few weeks after our son's first birthday, i'm flying to LA for three days for a girl's weekend. i'm totally freaked. i feel a little better about it though because i know that he will be with my husband who is nearly as AP as i am and will take great care of him. AND i am an experienced pumper, i know there won't be any problems with him having enough breastmilk, taking a bottle, or keeping up my supply while i'm gone. i don't know, some days i dread it and i'm scared but i'm also excited. i don't think it's going to hurt any of us. my greatest fear would be that he would want to wean after i've been gone for three days. i'm a committed long-term breastfeeder but i'm not so sure he is, kid sure likes his foods. our situation seems a little different than many other commenters though because we don't nurse to sleep. not because i'm not willing to! that's just how the nighttime schedule seemed to work best for us. i nurse him, we read books, play, and then dad does bedtime. so at our house having dad do bed won't be a huge change from the norm. however, other than this one special time i hardly ever leave the kid. besides when i go to work and he goes to his super-awesome AP babysitter. we do family date nights and frankly, i don't really *want* a night away from him. i like him. Okay, I'm way late joining the conversation here. Our son is 2 and we have never left him overnight. He still needs help falling asleep and I don't want to burden anyone with that and the fact that he wakes up to nurse a couple times a night...well, it would just be hard on him and whomever is caring for him. We have, however, left him with his grandparents lots of times so hubby and I could have a date. We try to keep it short, but nowadays he is able to go longer without us. This just sort of happened for us. It stemmed from the need to go places where we couldn't take him, so we had to leave him with someone, and when we found out that he did all right, we decided that we could leave him out of choice from time to time as well. I would still never leave him anywhere that would be upsetting for him unless I absolutely needed to. We make sure he feels very comfortable with the people he stays with. We took a chance on some neighbors we spend a lot of time with, and he did okay, and soon I think I may leave him with some other neighbors because he plays with their son and trusts the mother. But this works for us. Everyone has different needs, and children are adaptable, so if a parent needs to leave them with someone, then if they do it mindfully, it can all work out.